I have borrowed the name for this blog post about our latest travels in China, from our favourite Chinese artist, Zhu Wei, who used it for a series of paintings he did from 1999 – 2001. We first discovered this artist when dining at Raffles Hotel in Singapore at a restaurant called Doc Cheng’s, which we visited very often when we first moved to Asia. 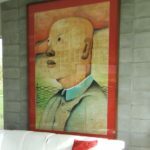 Andy later proposed to me at Raffles Hotel and then when we bought our first apartment in Singapore, we felt we just had to have a Zhu Wei painting and were lucky enough to eventually acquire one – China Diary #46. That painting hangs in our lounge room and reminds us daily of our strong attachment to Asia having lived in the region for 17 years. Visits to Asia are always trips we look forward to and our most recent trip in late August was a 4-cities-in-5-days whirlwind tour. Flying overnight from Auckland, (having spent the day at the NZ School of Food & Wine for a trade tasting and the Junior Sommelier competition that we sponsor), we flew overnight on Air New Zealand of course, and arrived into Shanghai early morning. We headed straight to our hotel — the Intercontinental Shanghai Ruijin– built in 1917 as a home for the Morris family from England – owners of the North China Daily News. During the ‘War of Liberation’ (aka the Chinese Communist Revolution), the hotel was the headquarters of the Communist Party in Shanghai and then became the State Guest House of Shanghai. It is a complex of four historical buildings plus villas occupying a large garden estate of over 40 hectares – which is the largest garden in the former French concession area of Shanghai. It’s quite an amazing hotel complex. Misha presents at Taste Spirit Wine School with 20 students in the class – and over 800 online! After a quick check in, we met Toni and Kurt from Prestige Wines, our distributor, and we were off! The key activity on our first day was a Masterclass at Taste Spirit, one of the leading wine schools in China. 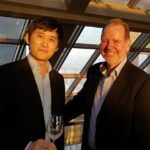 Young Shi is the founding partner and Wine Education Director of the school as well as being the Managing Director of Jancisrobinson.com business in China is. We first met Young Shi when she visited us in New Zealand many years ago. This was the second time we have been invited to present at Taste Spirit and this time we were scheduled to deliver a 2-hour Masterclass on Central Otago wine. 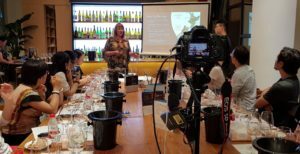 Not only did we have 20 senior wine students in the class, but we had a camera on us as over 800 joined in online with translated presentation slides also available to them. China does things on a big scale! The next morning we were up early and out to the airport with Toni and Kurt and on a 2 ½ hr flight to Guangzhou. We stayed at the stylish Langham Place hotel which is where we were also hosting a wine dinner in the evening at the Ming Court Chinese Restaurant. In the evening the wine dinner was in a large private dining room which oozed Oriental glamour and sophistication with the largest round table I have ever seen! The dinner was attended by 20 of some of the top hospitality trade in the city including Philipp Stieger, Director of Food and Beverage at Langham Place who’s an incredibly energetic guy who we enjoyed chatting with late into the night! The degustation menu at the Ming Court was spectacular and beautifully matched to our wines. We are very lucky to have our wines listed at this wonderful hotel. It was another early departure the next morning and Toni, Kurt, Andy and I were off to the train station to get a fast train to Shenzhen.It may have been a fast train (over 320 kms per hour our first class carriage digital display showed to us) but it was a very slow experience trying to get tickets and actually get onto the train. Never have we witnessed so many people at a train station trying to get a ticket! Andy joined Toni and they circumnavigated the enormous station (at running pace and in unbelievably hot and humid conditions as it was mid-summer in China) trying to find a way to get our pre-booked ticket without having to join an enormous queue at the collection counter. It wasn’t to be, and we had to re-schedule our departure for a later train. When we finally boarded, it was less than 40 minutes travel time and we arrived in Shenzhen. We were staying at the Shenzhen Langham Hotel – which is absolutely stunning and located in the CBD district of Futian. Shenzhen has a population of 12.5 million – a little smaller than Guangzhou’s 14.5 million but half the size of Shanghai’s incredible 24 million population. It’s a major city, and a very modern one, in the Guangdong Province of China north of Hong Kong. Our wines are served at the Langham Hotel in Shenzhen (including by-the-glass). 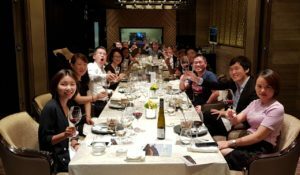 The wine dinner we hosted whilst in Shenzhen was at the Shenzhen Four Seasons Hotel at Foo Restaurant. Once again, we had a private room where we were delighted to welcome trade customers from many premium hotels as well as some consumers. It was a spectacular degustation with some expertly paired food and wine matches. 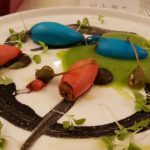 One of the dishes that stood out was a squid dish with one of the most incredible presentations of coloured squid I’ve ever seen. The next morning, we were up early for a transfer to the airport and the four of us boarded a 3.5 hour flight to Beijing. 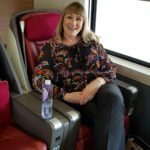 In fact it took most of the day to get to Beijing with the various logistics and traffic (as it’s a city of over 20 million) so we didn’t arrive into Beijing until mid-afternoon and checked into Hotel Jen – a hip hotel brand owned by the Shangri-La group. After a short break, we headed off to the Park Hyatt Beijing and to set up for our final wine dinner event. Located on the 66th floor of the hotel is the China Grill – it is one of the THE places to dine in Beijing. Beneath a dramatic Chinese lantern at the building’s apex, the restaurant features a soaring glass pyramid ceiling and glass walls. 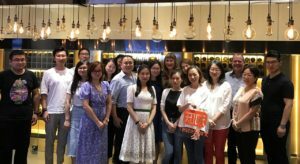 We were located in the semi-private dining area on a mezzanine level overlooking the main dining space – so not a bad location at all for our final fling in China. 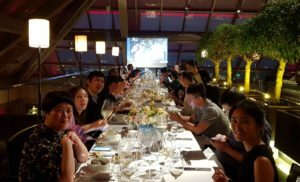 We welcomed nearly 30 consumers and trade to this wine dinner and it was a great way to finish our formal activities in China. On our final day in China we caught up with Kevin Yan who runs Prestige Fine Wines and had an enjoyable Dim Sun lunch. In the afternoon we headed out for a bit of shopping and walk around a bit before boarding our first flight on our journey to Bordeaux (for a week’s holiday). 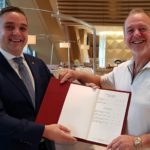 We feel very fortunate that our brand is represented by Prestige Wines – a small but incredibly focussed distributor who has always believed strongly in our brand and ensures our wines are located at some of China’s most prestigious hotels and restaurants. Thanks to Kevin and his colleagues, Toni and Kurt for an amazing China tour!